A new way of measuring the mechanical properties of bulk tissues in vivo identifies a stiffness gradient in the developing limb that correlates with patterns of cell migration. Model for durotaxis in the limb bud: Wnt5a regulates fibronectin expression, which produces a stiffness gradient in the mesoderm that guides mesodermal migration. 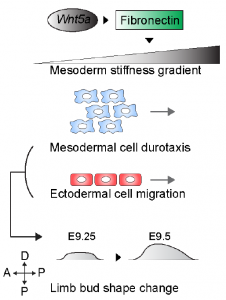 Ectoderm cells also migrate directionally but without a stiffness gradient. Collective cell migration correlates with tissue shape changes. As morphogenesis is inherently a mechanical process subject to physical laws, studying it requires methods for probing the mechanics of tissue development. We already know that cells in culture behave differently in different mechanical contexts. For example, stem cell differentiation is affected by substratum stiffness, and migratory cells move toward stiffer surfaces (a behavior called “durotaxis”). Determining how much of this behavior occurs in vivo requires methods for probing the mechanics of natural tissue environments. Existing methods for quantifying tissue stiffness include: (1) atomic force microscopy (AFM) – measuring how difficult it is to indent a tissue with a cantilever. AFM is great for spatially mapping the surface stiffness but can become really difficult to interpret with thicker tissues. (2) Deformation of ferrofluid microdroplets – injecting a magnetic fluid into the embryo and then measuring its deformation by a magnet. This method is relatively slow, however, and only one location can be probed at a time. Thus, it remains difficult to generate a map of tissue stiffness in vivo, particularly in thick, 3D tissue such as the vertebrate limb bud. The authors of this preprint developed a new method for spatially mapping tissue stiffness in vivo and used it to gain new insight into how the vertebrate limb bud is shaped during development. Their method involves the simultaneous displacement of several magnetic beads injected into a single embryo. For magnetic displacement, they built a custom device that generates a uniform magnetic field within a workspace that accommodates mouse embryos up to E10.5. Authors inject multiple magnetic beads into limb buds and then measure tissue mechanical properties by analyzing displacement under magnetic force. A stiffness gradient exists in the mesoderm but not the ectoderm of the limb bud. 3D cell tracking using time-lapse light sheet microscopy revealed new patterns of movement not previously detected with confocal imaging. The newly detected pattern of cell movement correlates with the stiffness gradient and requires Wnt5a, a known signaling molecule in limb development. The movement is not directed toward Wnt5a, however, but away from it. Optical projection tomography indicates that an overall change in tissue morphology correlates with the Wnt5a-dependent collective cell migration. Fibronectin is expressed in a pattern that matches the stiffness gradient. While Wnt5a is necessary for the fibronectin pattern, the two proteins do not appear in the same place at the same time. The authors propose that this disparity is due to the dynamics of expression: Wnt5a turns on fibronectin, but time is required for its production/secretion, and meanwhile the Wnt5a expression domain is dynamic – becoming increasingly distal as the tissue grows. Normalized stiffness maps of the wild type (left) and Wnt5a mutant (right) limb buds. Together, their data support the conclusion that in vivo durotaxis (cell migration guided by stiffness) alters limb bud morphology and that Wnt5a may influence limb shape not by acting as a chemoattractant but by modifying tissue stiffness. I am always on the look-out for new methods for biophysical characterization of tissues. There has been a lot of progress in isolated cells in culture, but working with tissues is much harder. They’re larger, more complex, and just trickier to access. This new method advances our ability to analyze bulk tissues and appears to be adaptable to other contexts, at least for tissues that are amenable to microinjection, studied by those scientists that are tech-savvy enough to build their own magnetic device. The tissues analyzed here were in the range of ~50-200Pa, but the full dynamic range of the technique was not really addressed. In terms of the biological findings, one obvious interesting direction for future work is the mechanism by which this fibronectin-based stiffness gradient influences collective cell migration. As the authors point out, the gradient in stiffness observed here (~0.5Pa/um) is just below the range that has been deemed detectable by cells in culture (1-400Pa/um). 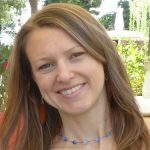 So maybe it has to do with the fact that we’re looking here at a collective behavior, or the combination of multiple signaling mechanisms. I’ll be interested to read more about the mechanism in the future. One thing I don’t understand is that there appears to be directional migration of both the ectoderm and the mesoderm, but the stiffness gradient is only in the mesoderm. Is the ectoderm somehow following the mesoderm? Or is the mechanism of migration different in the two different layers? Are they mechanically coupled? In sum, I would recommend reading this nicely-written and interesting preprint to all those interested in cell motility, morphogenesis, and tissue development!